MINNEAPOLIS - A deadly storm system churning through the central U.S. has blanketed parts of the Upper Midwest in heavy snow and ice and battered areas farther south with powerful winds and even tornadoes. 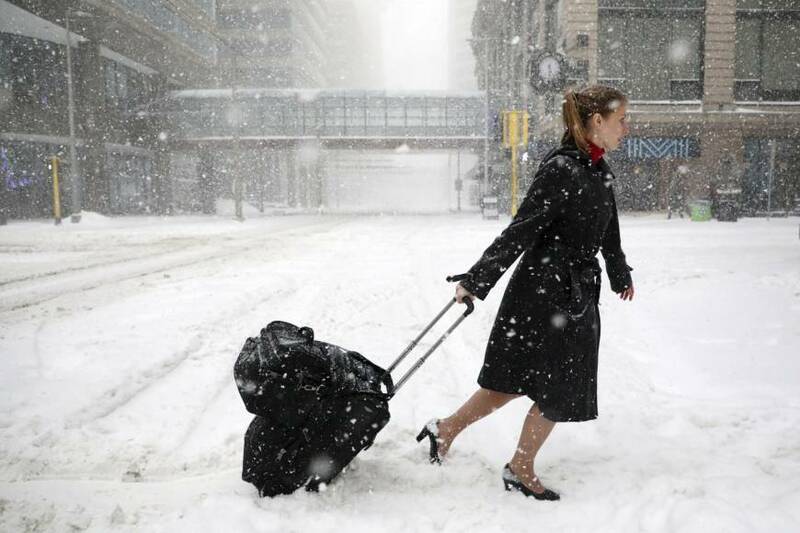 About 200 flights were canceled Sunday at Minneapolis-St. Paul International Airport, where two runways were open but nearly 13 inches (33 cm) of snow combined with strong winds were making it difficult to keep the runways open and the planes de-iced, spokesman Patrick Hogan said. On Saturday, the storm caused the cancellation of nearly 470 flights at the airport. The wintry grip on the Twin Cities continued to keep the boys of summer off the diamond, forcing the postponement of the third straight Twins-White Sox game. The Yankees and Tigers were rained out Saturday in Detroit and had planned to play a double-header on Sunday, but the first game of Sunday’s twin bill was also postponed, leaving just the night game. Two northeastern Wisconsin communities, Tigerton and Big Falls, received more than 2 feet (61 cm) of snow over the weekend, the National Weather Service in Green Bay reported. Parts of the state that were already blanketed were getting a second helping of snow on Sunday. The storm finally let up in South Dakota, allowing the airport in the state’s largest city, Sioux Falls, to reopen for the first time since Thursday. Interstates 90 and 29 in parts of eastern South Dakota also reopened, and no-travel advisories were lifted across the state border in southwestern Minnesota. The weather service predicted that a large swath of southern Minnesota, including the Twin Cities, could get up to 20 inches of snow (51 cm) by the time the storm moves eastward into New England. Keith White, a weather service meteorologist in Marquette, Michigan, said moderate to heavy snow was falling Sunday morning in Michigan’s Upper Peninsula. He said more than a foot was possible by early Monday in the communities of Ishpeming and Negaunee, west of Marquette. Powerful winds knocked out power to thousands of customers in Michigan, which was expected to get more snow and ice throughout the weekend. There have been three deaths blamed on the storm system, which stretched from the Gulf Coast to the Great Lakes. A sleeping 2-year-old girl in Louisiana was killed when a tree fell on her family’s recreational vehicle early Saturday. A Wisconsin woman was killed when she lost control of her minivan on slick roads and veered into an oncoming SUV. And an Idaho truck driver was killed when his semitrailer struck a semi in western Nebraska that had been stranded on a highway by the bad weather.